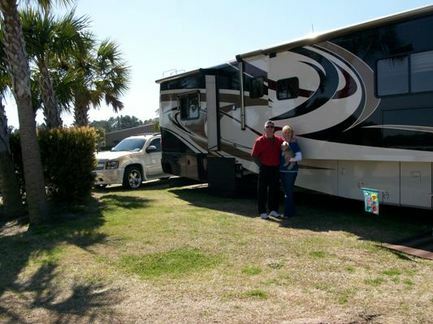 Francine Gipson wrote that her daughter in Alaska sent her a copy of QUEEN OF THE ROAD, thinking she would enjoy it, because Francine and her husband became full time RVers a year ago. After reading the book, Francine said she thought we had a lot in common. I believed her when I saw how she signed her email: It wasn't telling me that her rig was a 2007 Monaco Diplomat Special Edition, but rather her adding "like that matters, it's still a damn bus and I have no home to go to!" Don't you just HATE those signs that say, "Runaway Truck Ramp?" They always put the fear of God into me. I squirm and get really uncomfortable. Those signs and the 8% downgrade signs get my blood pumping. Tight turns, ugh. You say, "I'm going to die," or something of the sort ... I always chant (in my mind of course), Carrie Underwood's song, "JESUS TAKE THE WHEEL!" If I said it out loud, Les would probably desire dropping me on the side of the road - which, at times, would be a welcome relief. Ahhhh, the joys of bus travel. Les is employed in the Gulf of Mexico on an oil rig, and works two weeks on, two weeks off. They travel (apparently indulging his penchant for 8% downgrades, which sounds to me like he and Tim share a brotherhood) when he's not working. 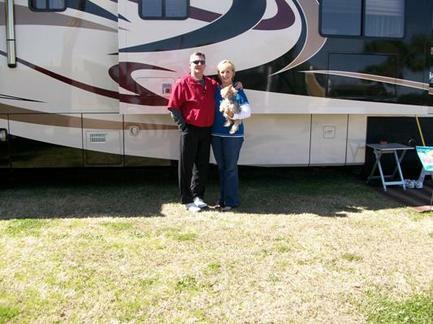 During the two weeks on, she has her Yorkie, Morgan, to keep her company at the RV park in Foley, AL. Here are pictures of Francine, Les and Morgan in Foley, AL. Oh, yeah - and the damn bus. Well sister, if you ever see our damn bus coming down the road, please do say "hello" (or run for your life - whatever seems appropriate at the time). I'm going to say "hello" while running for my life. You can kill two birds with one stone that way. And I thought I was the Queen of Multi-tasking. This page contains a single entry from the blog posted on February 25, 2009 8:19 PM. The previous post in this blog was Book Club Virgins No More. The next post in this blog is A Really Fantastic Book Club Wanted Me.